Internal Sony documents revealed by Wikileaks show that the Blu-ray Disc Association (BDA) is working on a new version of the Blu-ray copy protection Advance Access Content System (AACS) that requires an internet connection on first playback. AACS uses cryptography to control and restrict the use of Blu-ray discs and is the main copy protection of the format. Version 2.0 of AACS is currently under development and will be part of the Ultra HD Blu-ray standard. A document called AACS 2.0 Draft provides several details about this new copy protection. Ultra HD Blu-ray players will support two AACS 2.0 capabilities, one called basic and one called enhanced. Enhanced AACS 2.0 requires an internet connection during the first playback. The connection is used to retrieve a key that’s later stored on the device. 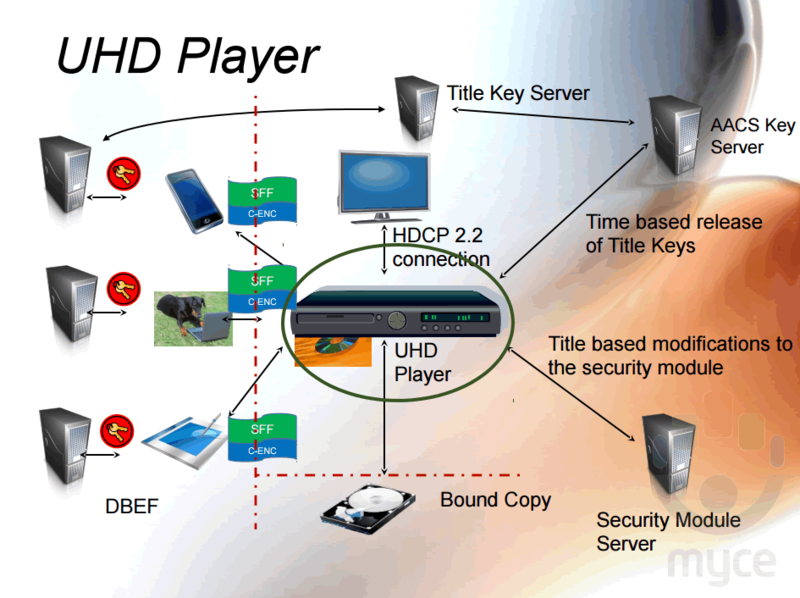 The documents also show that HDCP 2.2 is required to fully enjoy 4K content . Devices that don’t support HDCP 2.2. will get a downsampled (2K) version of the movie. Ultra HD Blu-ray players will also feature a Trusted Execution Environment where authenticated code can be executed, this appears to be an improved version of BD+. Many Sony documents also talk about a Digital Bridge device, this device makes it possible to make a Managed Copy. Managed Copy is something that’s part of AACS for some time and should make it possible to create a backup of a movie (also on USB sticks or HDDs) that can be played on other devices (e.g. tablets and smartphones) but that’s still protected by AACS, making sure the movie can’t be copied infinite. The feature will now likely become a mandatory feature on Ultra HD Blu-ray players. There’s likely much more to find in the Sony Hack documents, join us in our quest to find more!